Finishing with a calotte crimp or finishing with a clamshell criimp will give a professional smooth finish to your creations. These calottes are have a side-opening. 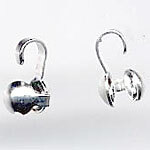 Calottes are suitable for the more flexilbe varieties of beading wire which can be knotted at then ends or between beads. The calotte enables attachment to a fasterner by going over the knot at the end of the straing. 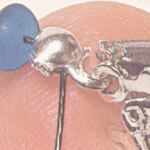 Calottes are also an easy way to attach several strands of beads to a fastener. These crimps are most often used with flexible beading wire but it can also very effectively be used with strong threads. If you are cutting the length of wire you need ahead of time, allow at least 4-5 cm extra on each side to attach the fastener for your jewelry piece. Only use a wire cutter to cut your wires; wires will destroy the edges of your scissors. 1) After stringing your beads, make an overhand knot at one end of your wire. Tape one end of your work to the work surface to anchor it while you are working with the other end. 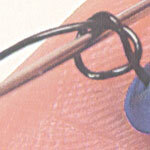 2) Place your knot into the calotte and gently press it shut with a flat-nose plier. Look for the little groove in the calotte for the thread to sit in. 3) You now want to put a knot at the other end of your work. So at the other end, make an overhand knot loosely. 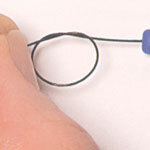 Put a blunt-ended needle in the loop and use the needle to slide the knot close to the beads. Make sure that the knot is close but not too close to the beads so that you have space for your calotte. It also ensures that your finished work will not be too tight nor inflexible. 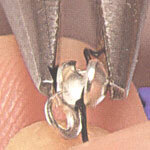 Place another calotte crimp over the knot as you did for the other end and gently squeeze close with the pliers. 4) You finish by attaching your fastener to the calottes. You can either gently open the loop on the calotte or the loop from the fastener - depending on the typ of fastener you are using. Cut off any excess length of wire/thread left handing out from the calottes.